La spiegazione che segue e’ estratta dal manuale di Chimera (che e’ in inglese). Radiosity assures the full handling of global illumination, shadows generation and efficient light distribution however, like any other raytracing legacy process, it is very slow. A common trick is to calculate radiosity not per point (“pixel” of a surface) but per vertex, then use OpenGL blending capabilities to interpolate color/luminance value between vertices. 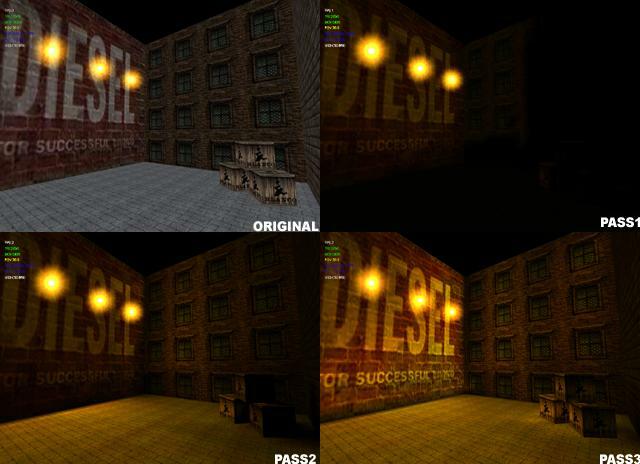 In this demo the exe calculate and saves the generated lightmap texture for every object. This way when you launch the scene again you can use the lightmap from the previously processed scene WITHOUT having the radiosity processor redo all the calculations from start. Lightmaps textured are stored in the DATA folder, named <obj>_xx_LITE.PNG.